"Long before ayahuasca tourism became a pastime for rich gringos, Peter Gorman was knocking around Iquitos and the Amazon. He's traveled the rivers and quaffed the brew with the best (and the worst) of them and been way, way beyond the chrysanthemum on many a dark jungle night. This is the intensely personal story of an old-school jungle rat for whom ayahuasca is not just a hobby, but a life-long quest." -- Dennis McKenna, Ph.D., ethnopharmacologist, co-author of The Invisible Landscape and founding board member of the Heffter Research Institute. 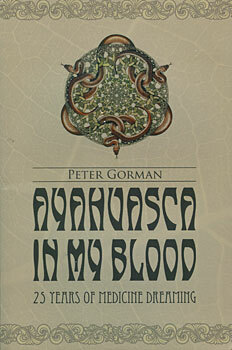 "Unlike many writing about ayahuasca, Peter Gorman knows this plant and these forests long and well. Explorer, ethnobotanist, writer and raconteur - Gorman is uniquely qualified to tell this incredible tale. A wild mixture of adventure, horror, spirituality, tenderness, and insight, Ayahuasca in My Blood is most highly recommended!." -- Mark J. Plotkina, Ph.D., President, Amazon Conservation Team and author of Tales of a Shaman's Apprentice.